Did you know Sun Wukong was named after a historical Tang Dynasty monk? Originally a Chinese diplomat of Tuoba origin, Che Fengchao (車奉朝, 731-812) was part of a royal mission sent to Kashmir in 751. Che was too sick to return with them in 753, so he stayed in country and was eventually ordained as a Buddhist monk with the religious name Fajie (法界), or “Dharma Realm”. He lived abroad for several decades before returning to China in 790. There, he presented Emperor Dezong with various translated Sutras and a Buddha relic in the form of a tooth. The emperor was so pleased that he renamed the monk Wukong (悟空), or “Awakened to Emptiness” (Wang, 2006, p. 66). It’s interesting to note that the name Sun Wukong does not appear in The Story of Tang Tripitaka Procuring the Scriptures, the 13th-century precursor of JTTW. Instead, the novelette refers to him simply as the “Monkey Pilgrim” (hou xingzhe, 猴行者) (Wivell, 1994, p. 1182). Therefore, the name Sun Wukong was most likely chosen by the compiler/author of the version we know and love today. Wivell, C.S. (1994). The story of how the monk Tripitaka of the great country of T’ang brought back the Sūtras. In Mair, Victor H. The Columbia anthology of traditional Chinese literature (pp 1181-1207). New York: Columbia University Press. Wang, Z. (2006). Dust in the wind: Retracing dharma master Xuanzang’s western pilgrimage. Taipei: Rhythms Monthly. Chapter one of Journey to the West describes Sun Wukong‘s birth from stone (fig. 1). There was on top of that very mountain [Flower Fruit Mountain] an immortal stone, which measured [36 feet 5 inches (11.09 m) in height and 24 feet (7.31 m) in circumference]. Though it lacked the shade of trees on all sides, it was set off by epidendrums on the left and right. Since the creation of the world, it had been nourished for a long period by the seeds of Heaven and Earth and by the essences of the sun and the moon, until, quickened by divine inspiration, it became pregnant with a divine embryo [xian bao, 仙胞]. One day, it split open, giving birth to a stone egg [shi luan, 石卵] about the size of a playing ball [yuan qiu, 圓毬]. Exposed to the wind, it was transformed into a stone monkey endowed with fully developed features and limbs (Wu & Yu, 2012, p. 101). Fig. 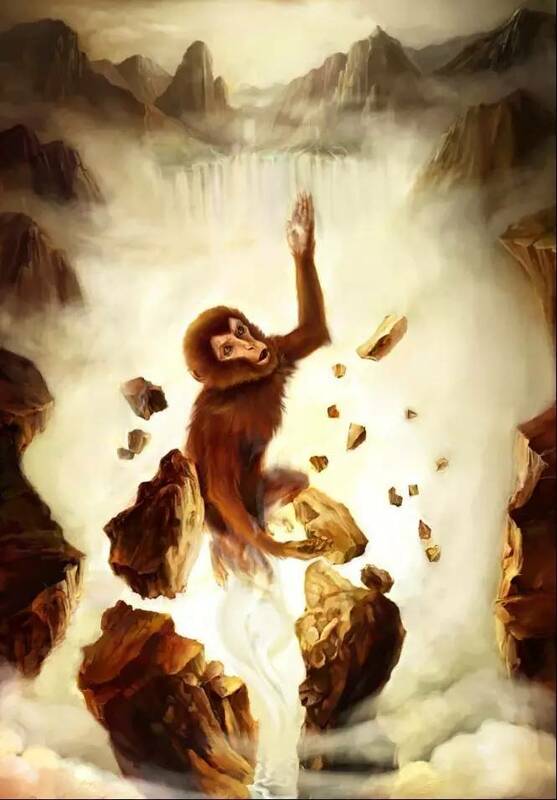 1 – Monkey’s birth from stone by Zhang Moyi (larger version). Found on this article. Yu went to appease the floods. He pierced through Huanyuan Mountain, and transformed himself into a bear. 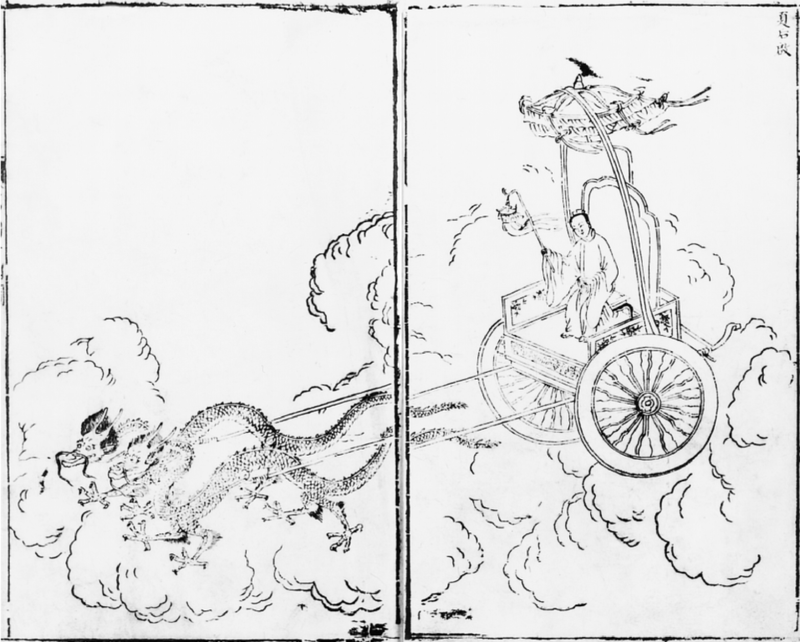 [Earlier] Yu had said to Tushan [土山, his wife], ‘At the sound of the drum, you would bring me food.’ Yu jumped on a piece of rock, and thus hit the drum by mistake. Tushan [brought the food and] went. She saw the transformed bear. Feeling embarrassed and distressed, she went away as far as the foot of Songgao Mount where she was transformed into a stone. Yu said to her, ‘Return my son.’ Facing north, the stone split open and gave birth to Qi [啓, fig. 2] (Wang, 2000, p. 54). Fig. 2 – A woodblock print of Emperor Qi of Xia from a Ming-era version of the Shanhai jing (larger version). Plate XLIV from Strassberg, 2002, p. 168. What I find interesting about this is that Yu and his son Qi went on to become great heroes and rulers after their births from stone. This parallels Monkey’s birth, enthronement, and later adventures. In a way, this makes Monkey a sort of literary spiritual successor to Yu. The compiler/author of JTTW may have wanted to literally cast Wukong as a cultural hero in the same vein as the flood conqueror by giving him a similar origin. This then would explain why Monkey comes to wield Yu’s cosmic ruler, the gold-banded cudgel, the means by which the future Xia emperor put the world into order, as a weapon. Also of interest is the fact that a later alternative name for Qi (啓) is Kai (開). Both of these names mean “open”, which no doubt refers to his legendary origins (Strassberg, 2002, pp. 169 and 219). Thanks to my friend Jose Loayza on twitter, I was surprised to learn that there is a Western counterpart to Sun Wukong’s supernatural birth. The Persian-turned-Roman god of light, Mithras, is often depicted being born from a stone, sometimes called the Petra Genetrix, or the “Fecund rock.” Manfred Clauss notes the symbolism of the rock is tied to the earth and the cosmic egg (I have uploaded the relevant chapter section here). The multi-layered quality of Mithraic symbolism…reappears in the case of the rock: represented and understood not only as the kosmos but also as the earth, on many images it is encircled by a serpent, [fig. 3] a creature associated with the earth (Clauss & Gordon, 2001, p. 67). We can discern the influence of Orphic speculation in a Greek inscription from one of the numerous mithraea in Rome, on a statue-base dedicated Διi ‘Hλω Miθpa Φávητı, that is to Deus Sol Mithras Phanes. Phanes is the embodiment of unlimited light, an Orphic deity who emerged from the cosmic egg. There is also literary evidence for the syncretism of Mithras with Phanes. In this community, therefore, Mithras’ identification with the sungod grounded an allusion to the Orphic-Platonic ideas current among the intellectual élites. 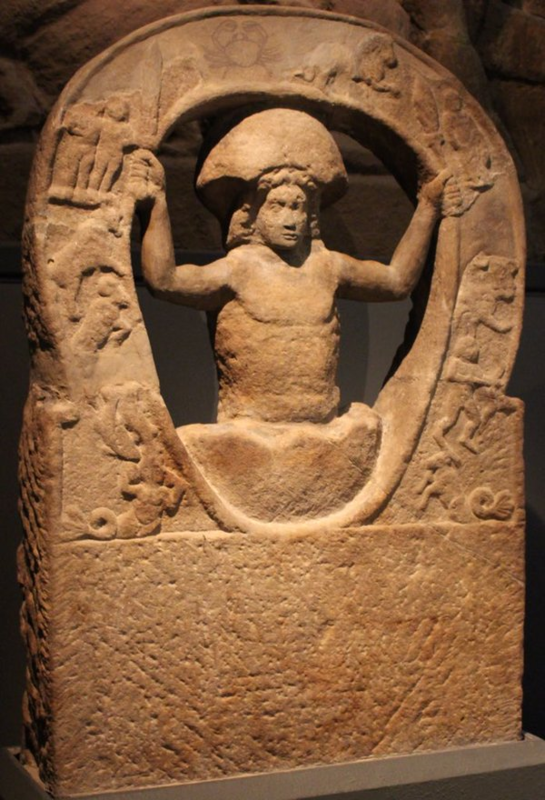 Mithras-Phanes is also known to us in iconographic form: a relief from Vercovicium (Housesteads) on Hadrian’s Wall shows Mithras emerging from the cosmic egg, [fig. 4] which is represented both as such and by the shape of the zodiacal ring (Clauss & Gordon, 2001, p. 70). Fig. 3 – An example of Mithras’ serpent-wrapped birth rock from Austria. A larger version is available on Wikicommons; Fig. 4 – The deity emerging from a cosmic egg surrounded by the western Zodiac symbols (larger version). From the Homesteads Roman Fort along Hadrian’s Wall. Found on this article. Like Yu the Great, Mithras’ son is said to have also been born from a stone. An unidentified writer of the second century ad, for convenience termed Pseudo-Plutarch, relates the following story (De fluviis 23.4). Mithras spilled his seed onto a rock, and the stone gave birth to a son, named Diorphos, who, worsted and killed in a duel by Ares, was turned into the mountain of the same name not far from the Armenian river Araxes (Clauss & Gordon, 2001, p. 62). Jong (1997) comments this tale is part of a wider story cycle present in many cultures. The hero (good or evil) born from a rock is a recurring topos in a cycle of myths that has known a wide circulation in the Caucasus. These myths are usually connected with the song of Ullikummi known from Hittite and Hurrian sources. 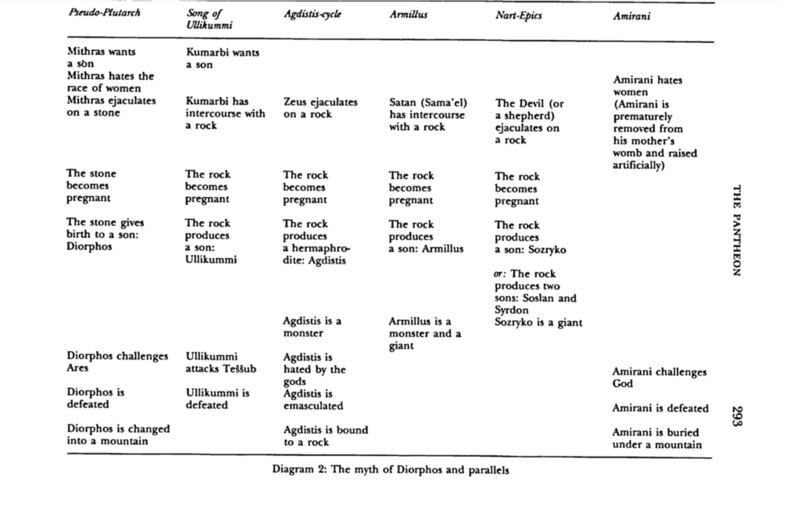 There are many more myths or complexes of myths which largely follow the same pattern: the cycle of Agdistis from Phrygia, the Nart-epics of the Ossetes, the Jewish myths of the monster Armillus and—for some aspects—the Georgian myth cycles of Amirani (fig. 5) (p. 292). Fig. 5 – A chart showing the existence of the rock-born son trope from other cultures (larger version). From Jong, 1997, p. 293. By presenting this information, I am by no means suggesting the birth of Mithras directly influenced that of Monkey. Far from it. This just shows the supernatural life-giving stone is a concept that has popped up in other cultures throughout the centuries. Therefore, it’s not unique to China. Such a story arising is only natural given that the earth can be used to grow crops, as well as shape pottery and figurines. In other words, the element can be used to both give life and imitate it. And since ancient people no doubt used earth to make effigies of their gods, it’s not a huge stretch to suggest they believed it could also give birth to supernatural beings. This means the idea could have arisen independently many times. Clauss, M., & Gordon, R. (2001). The Roman cult of Mithras: The god and his mysteries. New York: Routledge. Jong, A. (1997). Traditions of the Magi: Zoroastrianism in Greek and Latin literature. Leiden; New York: Brill. Strassberg, R. E. (2002). Chinese bestiary: Strange creatures from the guideways through mountains and seas. University of California Press. Wang, J. (2000). The story of stone: Intertextuality, ancient Chinese stone lore, and the stone symbolism in Dream of the red chamber, Water margin and the journey to the West. Durham [u.a. : Duke Univ. Press. Wu, C., & Yu, A. C. (2013). Journey to the West, Revised Edition, Volume 1. Chicago: University of Chicago Press.